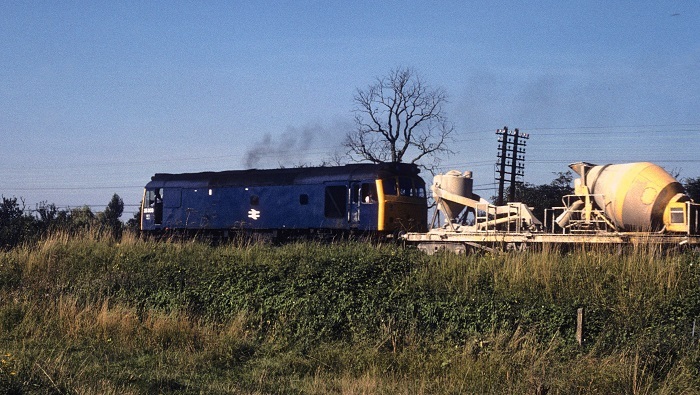 Photograph courtesy Roger Geach 25203 with an electrification train north of Elstree on August 28th 1979. The fifteen year five month career of D7553/25203 was spent allocated to a handful of London Midland depots. October 1967 to Carlisle (12A). May 1973 to Kingmoor (KM). 25203 was the 79th Class 25 withdrawn, one of seventeen retired during December 1980. 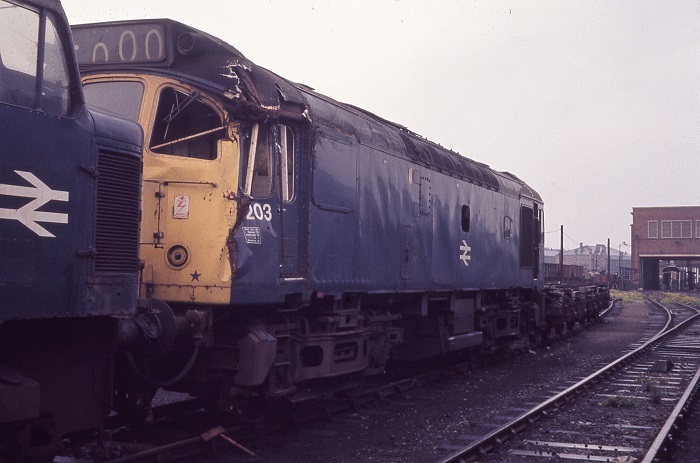 After withdrawal 25203 was broken up at Swindon Works by the first week of March 1982. Noted Derby Works June 1974 (dual brakes fitted). Noted Derby Works August - December 1977 (collision repairs). D7553 was barely a month old when it worked its first recorded passenger working, On July 23rd 1965 D7553 & D5243 worked the 12.12 Sheffield - St. Pancras throughout. On July 17th 25203 & 25222 worked a roundtrip Leicester - Skegness. Six weeks later on August 28th 25203 & 25204 worked a Wellingborough - Scarborough to Nottingham, returning with the 12.01 Scarborough - Leicester from Nottingham. The next day (29th) the same pair worked a relief Leicester - Skegness roundtrip. Late on the evening of July 7th the Euston carriage pilot, 25203, over-ran a signal derailing itself and three vans. As well as suffering cab damage it severed signal cables and electrical lines causing a blackout at Euston station. Principal delays were caused to the sleeper services, next morning six platforms were useable, by midday normal working had resumed. For the London Division it was one more machine out of service, making the use of visiting Class 25s all the more common on local workings. 25203 awaits in the Derby Works deadlines east of the Test House, September 10th, 1977 with minor cab damage sustained at Euston on July 7th 1977. On July 21st 25203 & 25032 worked the Derby - Norwich - Yarmouth - Norwich - Walsall diagram. A week later on July 28th 25203 worked the 10.40 Manchester Victoria - Llandudno Town. 25053 & 25203 top and tailed an electrification train at West Hampstead on August 28th. On March 7th 25203 & 25095 were noted passing Wolverton with a freight. On March 16th 25203 & 25251 were noted at Bedford on a Sunday engineers train. 25203's last year in service saw passenger workings on two days. On July 26th 25203 worked the 08.42 Sheffield - Huddersfield (to connect with the 08.55 York - Llandudno Town) and later worked the 09.00 Llandudno Town - York forward from Huddersfield after 40030 failed. The final passenger workings took place August 23rd when 25203 & 25267 worked the Walsall - Norwich (for Yarmouth) - Derby diagram. 25203 was withdrawn on December 1st 1980. A cabside number panel with TOPS classification panel escaped scrapping. Last updated September 24th 2017.